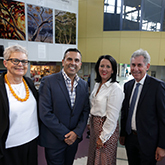 In the Department of Intensive Care Medicine at St George Hospital, with the support of the St George and Sutherland Medical Research Foundation, the University of New South Wales and a Special Ministerial Equipment Grant (Hon. Jillian Skinner, MP), we have established a Thermoregulation Research Program on Brain Injury, which has recently been augmented by the purchase of Advanced Neuromonitoring Equipment. 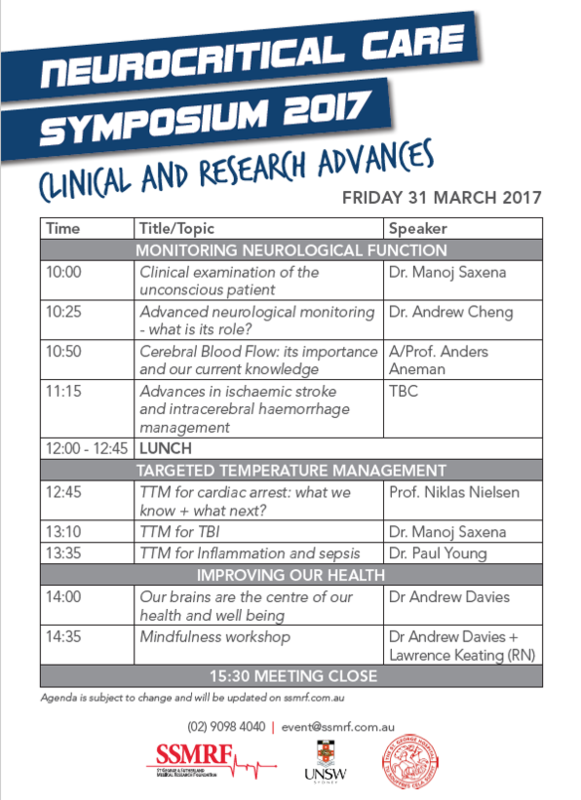 This Symposium has been organised to bring together an outstanding faculty of international experts to interact synergistically with a local audience to focus on key areas of clinical management and related research to understand present challenges and look to the possibilities of the future; we would encourage all members of the academic community, and the multidisciplinary teams that are involved in the care of patients with acute brain injury, to attend and contribute. Brain injury as a result of trauma or vascular lesions is a common reason for admission to critical care. Mortality rates are high and disability is common in survivors. Brain injury is complex and challenging for individuals, their families and the health care system. Clinical management has improved over time, but there are still areas of uncertainty. Individual videos FROM THE 2017 SYMPOSIUM can be watched on the SSMRF YouTube page here. Professor Niklas Nielsen (Helsingborg Hospital, University of Lund, Sweden) and lead author of the TTM for Cardiac Arrest study (New England Journal of Medicine 2013). Dr Paul Young (Wellington Regional Hospital,New Zealand and the Medical Research Institute of New Zealand) and lead author of the HEAT study (New England Journal of Medicine 2015). A/Prof Andrew Davies (Frankston Hospital, Victoria) will discuss how to “look after our brains” as we deal with the challenges of our work and life. Registrations are essential: medical $100; allied health (inc nurses) and students $50. Lunch and Afternoon Tea will be provided, so please indicate any dietary requirements when booking.